The financial sector is one of the most rewarding and lucrative industries you can join. Behind every business, from local start-ups to booming, nationwide companies, is a financial department holding it together. Finance and insurance even represented 7% of US gross domestic product in 2014, which amounted to $1.223 trillion. Which States are Improving Their Financial Sectors? We tracked the amount of accounting and financial positions in each state from 2009 to 2016 to see how well each state’s job prospects are growing. Looking at the top performing states, Arizona saw the biggest increase in jobs, beating out Texas for most improved financial sector with a 20% increase from their 2009 total – growing from 171,000 jobs to more than 205,000. Texas remains a staple of the US financial industry, using a 16% increase to surpass New York in total jobs (731,000 vs 709,000). New York finished 27th in our research, with just 3.9% growth. Some other areas are still struggling to recover from the economic crisis, with 16 states seeing decreases in their total number of jobs since 2009. Mississippi was the lowest ranked state, seeing a 6.8% decrease in their financial employees, which may be evidence of an occupational drain on some states by higher-performing ones. For example, New Mexico finished in the bottom 10 of all states, likely due to it being surrounded by Arizona and Texas, who are enjoying the most growth. Louisiana, Arkansas, and Oklahoma all registered a decrease in their total occupations, and a similar situation is developing in the Northwest. South Dakota and Wyoming were both in the bottom five of our research (with their amount of jobs showing decreases of 3.2% and 5.4%, respectively), whereas North Dakota showed the third most growth in the country at 15.8%. While this gives us a general overview of the country, we wanted to drill down further into the industry and examine where the best accounting and financial options for you may lie at different points of your career. It’s common for employees to move to another state for career progression, now more than ever as Millennials are the most likely generation to switch jobs. 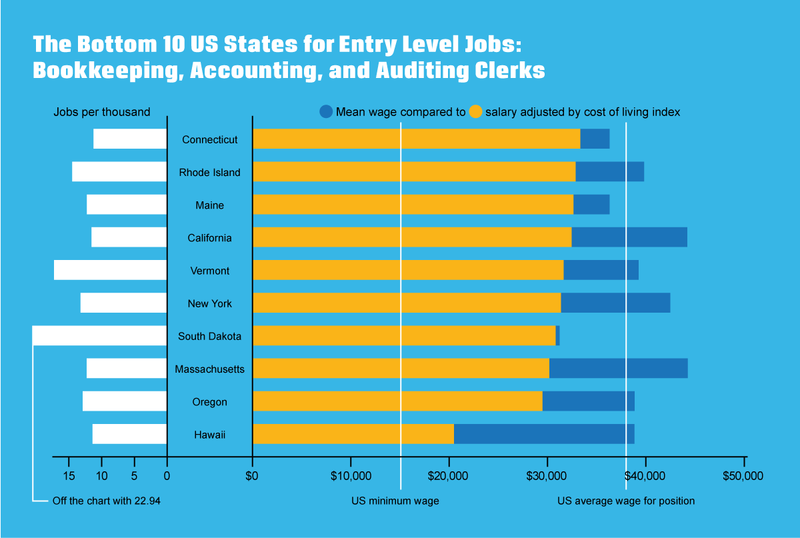 We looked to see where in the country would be best for entry, medium, and high-level financial jobs, and for that we need the Cost of Living Index (CoLI). What is the Cost of Living Index and How Does It Affect Your Career? The CoLI is calculated by considering the price of what is considered a representative sample of goods and services from specific industries. This includes groceries, housing, utilities, transportation, health care and other miscellaneous goods and services. When considering moving state for a new position, or to start your financial career, the change in your cost of living can be dramatic and is therefore an important factor to stay aware of. The Index granted to each state is a figure in comparison to the national average, which is represented as 100. For example, an area with a CoLI of 50 would pay half as much for the same goods as the national average, and an area with an Index of 200 would pay twice as much. By adjusting the mean wage with the CoLI, we get an accurate representation of how well you can be paid for the same position in a different state. More importantly, it may just steer you towards some locations you wouldn’t typically consider if you’re looking for a specific opportunity. Which States are Best for Different Careers? 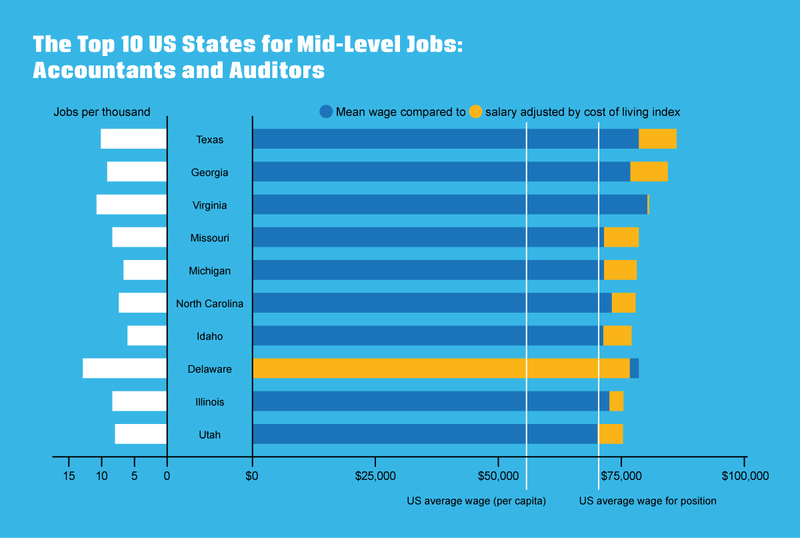 Medium-level roles were represented by the classification of “Accountants and Auditors,” and high-end occupations were represented by the title “Financial Manager.” The annual mean wage for these positions was found across all states and then adjusted for that state’s cost of living. Texas tops our chart, with a nearly 10% effective increase for salaries for people working in the state. Their annual mean wage was 16th-highest in the country, though it tops every other state when adjusted for cost of living. Georgia and Michigan were also high-ranking states, with employees’ salaries comparatively stretching over $3,000 further thanks to their low CoLI. Mississippi enjoys the lowest CoLI in the country (85.3), meaning that entry-level workers enjoy a $6,000 boost in their representative salary. 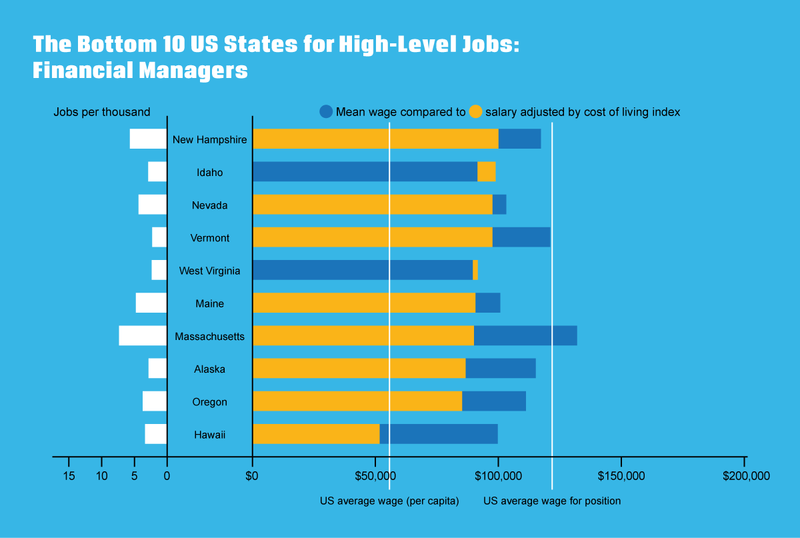 Comparatively, a high cost of living can eat into an initially large starting salary. This is an important factor if you are considering starting your career in New York or California. Adjusting the salaries by either state’s CoLI mean you effectively lose out on $10,000 of your salary. This is the case on the east coast, with Massachusetts, New York, Vermont, Maine, Rhode Island, and Connecticut all appearing in our lower performers. Hawaii has the highest Index of all states, at 192.8, meaning a mean salary of around $38,000 is worth $20,000 when compared to the national average: an important factor to consider if you are pursuing a career there. Switching to mid-level positions, Texas and Georgia still hold the top spots, showing them to be very good long-term career locations. Virginia and Missouri are also shown to be competitive options—Virginia thanks to its high annual mean salary and Missouri thanks to a CoLI of 91.4, which makes $71,500 actually feel like $78,500. Michigan and Illinois were also holdovers from our entry-level research. Our lower-performing states also saw some holdovers from our previous graph. 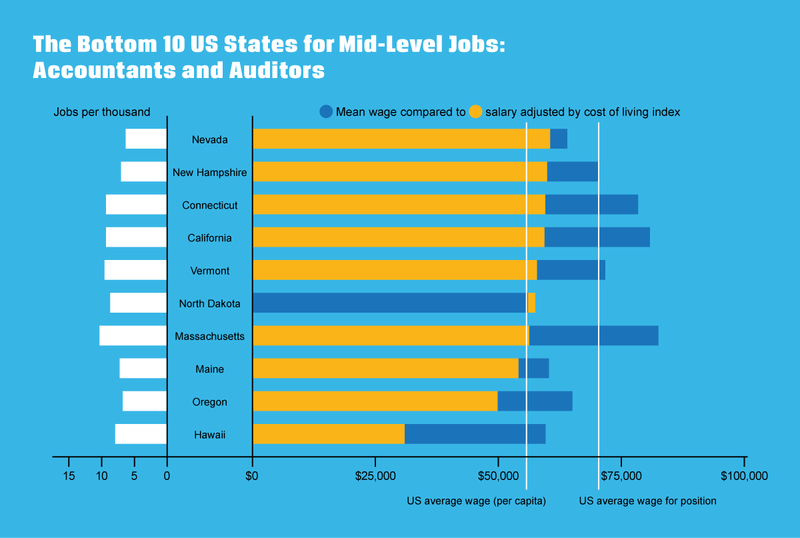 When looking at mid-level careers, Hawaii, Oregon, and Maine have a strong amount of jobs, though unfavorable adjusted salaries. North Dakota, despite having a CoLI of 97.4, still appeared in our bottom five as it offers the lowest annual mean wage across the country. If you’re looking for a career in Massachusetts, it is one of the top-performing states for positions per 1,000 people, though be mindful that it also has the third-highest Index in the country at 146.7. Executive and management positions are often strongly linked with the typical financial capitals of the US, such as New York and California, and while Texas remains top of our research, Delaware has emerged as an unlikely contender. 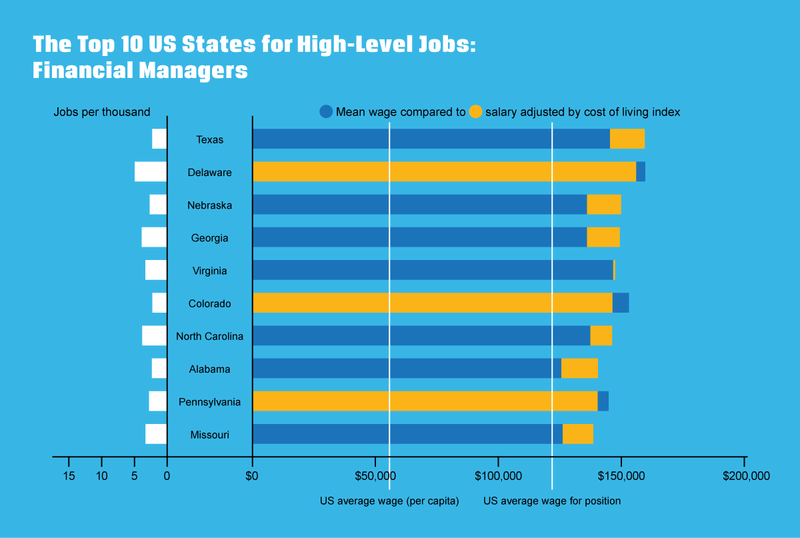 Delaware offers more than twice as many management jobs compared to Texas, and even with an above average CoLI it has the second-highest adjusted salary in the country. Nebraska also appears to be a good target for later career moves: its ranking has improved as job seniority has increased. Ranked 26th in our entry-level data, it moved to 15th for mid-level jobs before coming 3rd for management positions. Looking at management careers put some states in a new light, as Idaho, West Virginia, and Alaska (previously mid-ranking states) dip into the bottom 10. Hawaii is still hindered by its CoLI, which naturally hits highly-paid positions the hardest. Pursuing careers with top-scale salaries is always a balancing act, as you’ll find your costs will naturally increase too. If you’re looking to apply for managerial positions, make sure that you look for locations that mean you can balance expected wage with your changing lifestyle. There are some clear top-performers when considering both which financial sectors are growing and how competitive their salaries are. 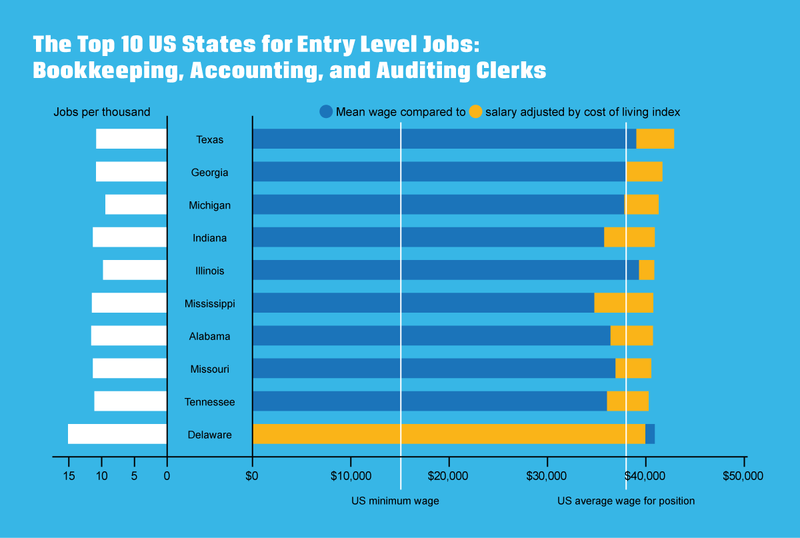 Texas, Delaware, Georgia, and Missouri are the only states to appear in the top positions at all three stages of employment. Coupling this with the fact that they all registered increases over their 2009 job totals, and these four states are great options for financial work, no matter your level of experience. Some states, such as Hawaii, Oregon, Massachusetts, and Maine, will require careful consideration if you’re looking to apply for jobs there. It’s all a matter of balance when looking into applying for a job in a new state. New York and California will always be attractive markets, though you should keep in mind your living situation and perhaps pursue careers there once you have gained a large amount of experience. Whether you’re considering where to start your career or are looking to apply elsewhere, remember that some states are more suitable depending on your experience. It’s common for workers to move up the career ladder with lateral and diagonal moves, finding more senior roles in new companies. Consider what point you’ve reached in your career and don’t be afraid to take the next step, wherever it may take you.